We were each survivors of our upbringing: lost, unloved and afraid. But like moths to a flame, we couldn’t stay apart. And then we shattered each other’s hearts. 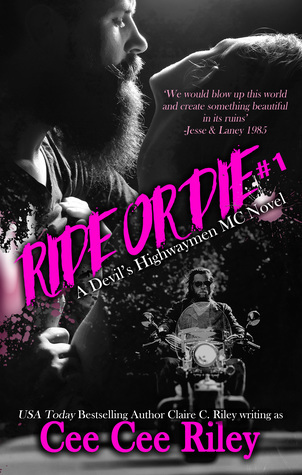 Jesse was a hard man: a biker outlaw for the Devil’s Highwaymen MC. I was Laney: the daughter of a dead mother and a father that didn’t know or want me. We were doomed right from the start. But this was our romance. And this was our disaster. And hopefully, this would be our second chance. I am a huge fan of Claire's writing, and was really looking forward to this biker/MC romance book. This is one of my favorite genres and it isn't easy for authors to come up with new story lines that feel refreshing. I was hooked on this story the first half of the book. I really liked the Jesse and Laney, and couldn't wait to read how their relationship would develop. These two meet when they are teenagers, and there is a click right away. Throughout the book we learn more about their relationship, which I really liked. However, after I was halfway done, I couldn't really get into the constant switch between present and past. In some books this works really well, but in this book it made it difficult for me to connect with the characters. I was hoping for a strong second chance romance, nevertheless it fell a bit flat for me. The reason why Jesse and Laney split up would've had a stronger impact if it happened somewhere else in the story. For me the biggest problem I had with this book was the structure. It didn't have a great flow, which made it really hard for me to get into the story. I enjoyed learning more about the ins and outs of the MC, and the suspense element was done really well. However, for me this wasn't a complete story. We got a lot of Jesse and Laney's relationship in the past time but just a little bit of in the present. I wanted to read about their love in present time. It was just rushed and that is one of the reasons I couldn't rate it higher than three stars. I will pick up the next book to see where Claire is planning on taking this story. Claire writes on the darker side of fiction, dipping her pen into genres such as post-apocalyptic, dystopia, thrillers, and even some horror. She writes characters that are realistic, and kills them without mercy. She also writes under the pen name of Cee Cee Riley, where she writes in the contemporary romance and post-apocalyptic romance genres. Claire lives in the United Kingdom with her husband and three daughters. She believes in cupcakes, rum and bathroom rap battles are the solution to most of life’s problems. Claire is represented by Michelle Johnson of Inklings Literary Agency.